Instead of flying toward the Citadel, it circles, surveying the landscape, searching for prey. The Great Beast casts an ominous, rapidly moving shadow over the stone canyon walls as it circles. Slowly it circles, again and again. The Great Beast ignores Gnarl�s taunt, its flight does not quicken, and continues its slow circular path. As the Great Beast rounds to face Gnarl, it abruptly tilts its body and nosedives directly toward Gnarl, letting loose a huge lightning blast from its mouth. Gnarl dives to the side and throws with amazing speed and accuracy his bat hand axe, which causes a long cut on the nose of the Great Beast. Instead of dropping to the ground, the bat axe changes into a flying, more mobile living metal bat form, then flies back toward Gnarl, making a high-pitched metallic humming sound caused by its blurred, rapidly beating wings as it returns to its master�s hand. The Great Beast continues to pursue Gnarl with three rapid lightning blasts from its mouth. The scintillating lightning blasts flash brilliantly in the early evening sky. Gnarl feels the heat of each stoke as it passes by, narrowly missing him, but he is able to dive to safety unscathed every time. Each lightning blast leaves behind a small crater in the canyon top earth, spewing clouds of dust and earthen debris into the canyon air, followed by ascending wisps of earthen smoke. The lightning blasts nearly blind Gnarl, who has to focus on the position of the Great Beast�s mouth in order to have enough time to dive out of the way. The Great Beast banks to the right and ascends for another pass. Its eyes scan for Gnarl�s presence but he has apparently disappeared. If the creature had eyes in the back of its head, it might be able to see a shimmering rectangular door open just at the back of its skull. Alas, it does not. This leads to pain. Gnarl exits the shimmering door and quickly grabs hold of the Great Beast�s hide with one hand. 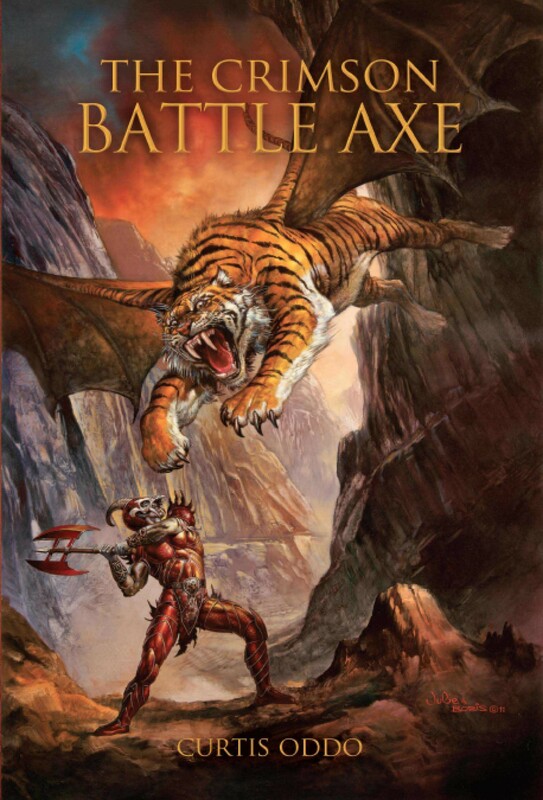 With the other, Gnarl repeatedly drives his blazing, yellow-orange flamed battle axe into the back of the Great Beast�s skull. In response, the Great Beast rolls with its back to the canyon floor, clawing at the back of its head, trying to rid itself of the hidden creature causing the searing, stinging pain. Gnarl rolls and evades the Great Beast�s claws, his one hand clutching thick tufts of hide to keep from falling off the Great Beast�s rolling aerial body, with Gnarl�s feet dangling toward the canyon floor. The Great Beast�s aerial rolling causes its massive body and its rider to plummet rapidly. Gnarl catches blurs of landscape whizzing by, while one hand remains firmly anchored to the Great Beast�s hide. Using all his strength he whirls his body forward toward the Great Beast�s hide to deliver two more tremendous blows with the flaming Crimson Battle Axe. The Great Beast rolls again to its front, hovering in midair between the lips of the canyon crevice. Roaring, scraping with its claws, the Great Beast manages to swipe Gnarl free from its hide, sending him spinning through the air toward the canyon wall. But the Crimson Battle Axe enables Gnarl to fly, and he ascends instead of crashing into the rapidly approaching rock wall. Gnarl quickly veers right, evading the lightning blasts raining down from the Great Beast�s claws as the blasts pockmark the canyon floor. The Great Beast struggles to stay aloft as another creature with a shadowy outline takes two steps forward from a ledge of the canyon wall opposite Garon. Facing the Great Beast, the creature hurls a javelin, burrowing it into the lower gum line of the Great Beast�s open mouth. The Great Beast freezes, dropping like an enormous boulder to the canyon floor, by its great mass pulling on top of it the outcropping of rocks to which the arrows were tied. Immediately a roaring finger of whirlwind appears and descends from the sky, seemingly pulled down by the open palm of one of the hands of the wind wizard, tearing apart the canyon wall directly above the Great Beast. An avalanche of rock rumbles down, covering the Great Beast�s immobile body, pummeling it into the hard canyon floor. The canyon echoes with the sound of the thundering rock avalanche, as dust fills the air and further trickles of smaller rock descend on the pile covering the Great Beast�s body. The whirlwind ceases. Garon and Hailstriker look directly down on the rock pile burying the Great Beast. Perez Aziz stares down from his rock ledge. Gnarl and Lord Basteel, on horseback with his lance ready, watch from the canyon floor, waiting next to each other, trying to peer through the dust for any sign of movement. The rock pile starts to rumble and shake as the Great Beast struggles to move. Lightning blasts from his mouth and front paws clear the rock directly in front of him, sending rock missiles thundering against the opposite canyon wall.